Here is a pretty cool fire truck. Emblems removed. Photo from Sven Bengston. Think I'll go with seagrave. Handsome beast, indeed. Looks like an Indiana, but I'm gonna guess Brockway cuz Brockway don't get no respect at all. will partner with the Hamish on Ahrens-Fox..
Dad says Autocar for the chassis. I say McCann body. Trucks, give me trucks!!! --- I'M LIKING TRUCKSWhen we see what we want to see, and hear what we want to hear---- all too often we miss the point! I'm where I'm at when I'm all there! But,when I'm here, how can I be all there? I've been pulling my hair out trying to match this chassis with something -ANYTHING - but I am not having any luck. Yes, it resembles an Indiana, some Federals, and even some Ahrens-Fox models, but nothing is a good match. The grilles may be similar but the fenders don't match etc. And the headlight mounting is very unusual for this style of truck. 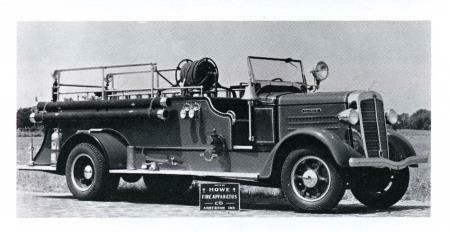 What we do know is that the fire apparatus is by Howe in 1942, and this is a 750 GPM Defender. 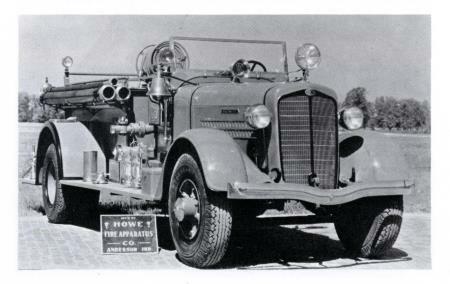 And it seems quite possible, especially with civilian truck production halted in 1942, that Howe assembled this entire truck, and others like it. In any event, it is a pretty sharp looking unit. Warren was 1st with Howe. Thanks to Sven Bengston for the photos.